For a while now I have been promising myself to give this "no knead" bread method a go. Everyone is talking about it and I have been slow to get with the program! With a little bit of time of my hands after work and with any excuse to put the oven on to warm up the house I flicked through a few bread recipes. I couldn't find exactly what I wanted so I attempted a combo of a couple and the result was so satisfying, and it looked amazing, even if I do say so myself. I had been keeping some sour milk in the fridge that I wanted to use, instead of buttermilk. I had to save it a couple of times from being tipped down the sink by the man! 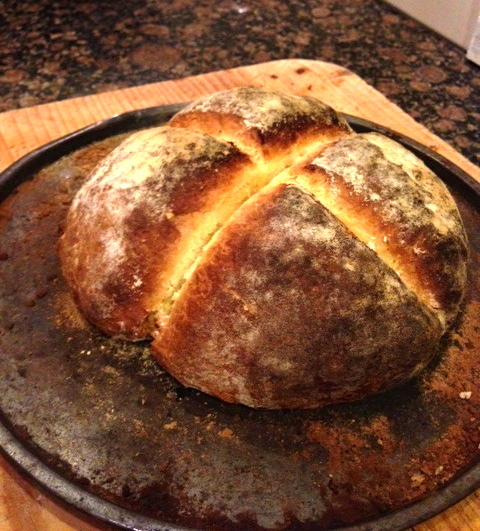 It worked a treat in this bread and gave it a lovely scone like texture. This bread takes hardly any time to make, no proofing, so I feel confident that it can be whipped up at short notice...... well quickly anyway. And you are bound to have all the ingredients. If no sour milk add some lemon juice to normal milk. 340ml of sour full cream milk. 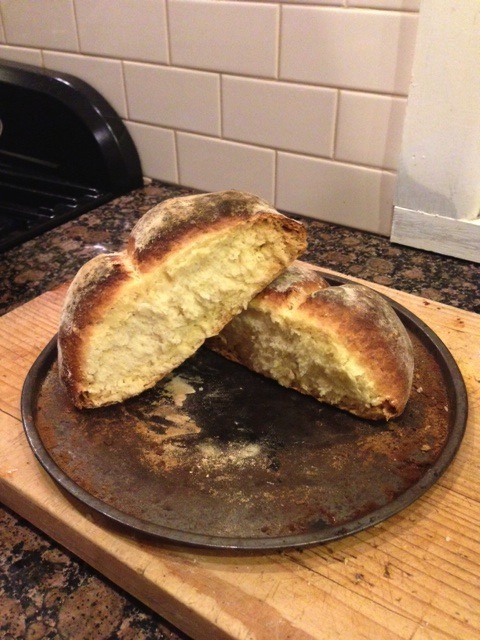 Turn out onto a floured board and knead together for about 1 minute until the dough is smooth. Form into a round flattish ball. Put the dough onto the tray and with the handle of a floured wooden spoon press down nearly to the bottom as if to divide in half and in half again. Lightly dust the top of the dough with flour and place in the top of the oven. Bake for 30-40mins or until cooked. Tap bottom if it sounds hollow its cooked. If it needs a bit longer cover the top with tin foil so that it doesn't burn. It cooked quickly and smelt amazing. 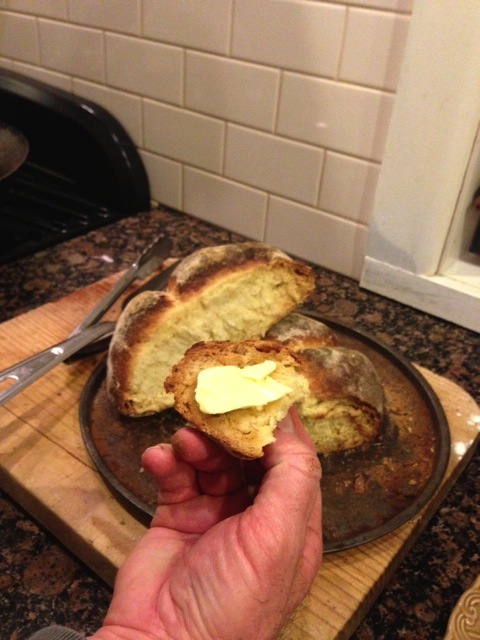 We broke it open straight from the oven and couldn't resist a piece slathered with butter. Very naughty, but nice. Perfect with some hot soup on a chilly night. 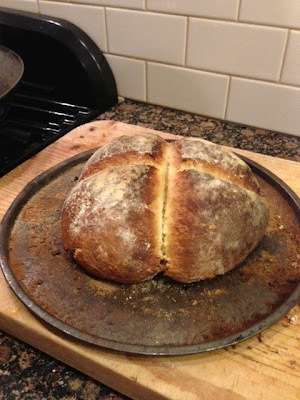 looks so enticing and beautiful... and isn't it A GREAT way to bake bread? Love it! And it was all down to you, you know. Just wished I had taken your advice sooner! 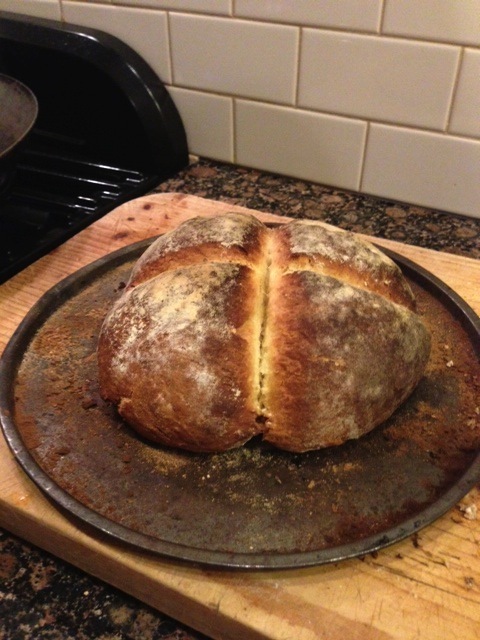 It certainly takes the pain out of breadmaking. The only problem Mary is that you eat too too much of it. I have inspired myself - I am making it again today as we ate the whole lot yesterday.